CarGurus has 19,482 nationwide Pathfinder listings starting at $2,000. Insatiable demand for crossover SUVs has transformed the Nissan Pathfinder into a path follower. 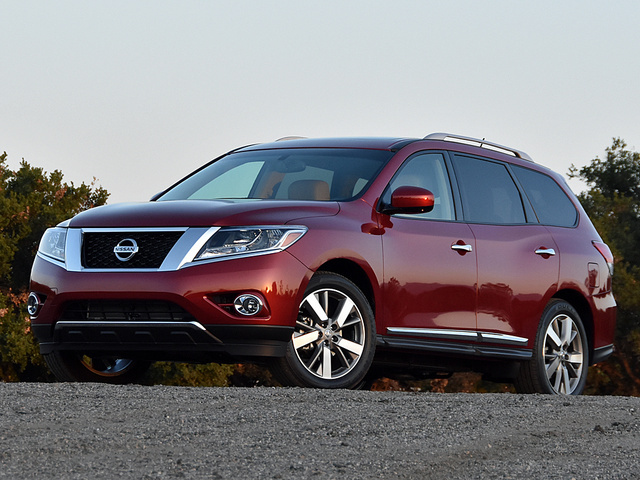 With the 2016 Pathfinder, Nissan gets many things right. However, at the same time, Nissan gets many things wrong. The result is a functional but forgettable family-sized crossover SUV. Remember when the Nissan Pathfinder was cool? When you could identify it with no more than a glance, and you instantly knew that it could go just about any place and do just about any thing and at just about any time? And because it was a Nissan and not a Jeep, you trusted that it wouldn’t break down miles from civilization? Now look at it. Take those Nissan badges off, and the 2016 Pathfinder could be any other 7-passenger crossover SUV. Today, instead of finding pathways to adventure, it's best used finding pathways to the local mall. Don’t blame Nissan for this turn of events. Insatiable demand for exactly this sort of vehicle has transformed the Pathfinder into a path follower. 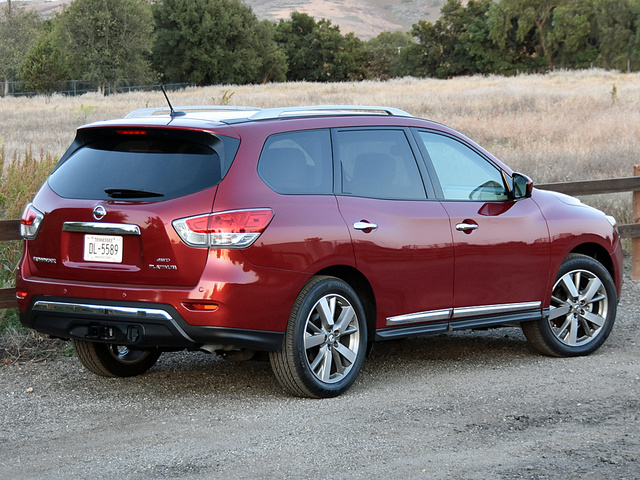 As 3-row crossover SUVs go, though, the Nissan Pathfinder is a sensible if not a particularly compelling choice. You can buy a Pathfinder for as little as $30,730 (including the $900 destination charge). That sum parks the basic S trim level with front-wheel drive (FWD) in your garage. For an extra $1,690, you can equip the Pathfinder with a 4-wheel-drive (4WD) system. Upgrades include the SV, the SL, and the Platinum trim levels. Nissan further distinguishes the leather-lined SL variant with Tech and Premium sub-trim designations. Choose the Pathfinder Platinum and install every factory option, and the price tops out at $47,485. My Pathfinder Platinum test vehicle nearly came to that sum. It included 4WD, the Family Entertainment Package, and floor mats for a grand total of $46,110. While its styling may qualify as nondescript, the Pathfinder isn’t ugly. Yet. No doubt, Nissan is fixing to install boomerang-shaped this and V-motion-shaped that, so if you’re interested in this SUV but you’re not happy about how modern Nissans look so surprised all the time, you’d better act fast. If you like the way the Pathfinder looks on the outside, you’ll probably love the interior, especially now that Nissan is offering greater contrast levels between the beige and the black parts of the Almond-color interior choice. Although the dashboard is composed of hard plastic, gloss is non-existent, giving the cabin a richer appearance. Furthermore, the spots where you’re likely to rest an arm or an elbow are softly padded, and in many respects there is a sense of quality that's missing from other Nissan models… perhaps because the Pathfinder is the only one to also form the basis for an upscale Infiniti model, in this case the QX60. 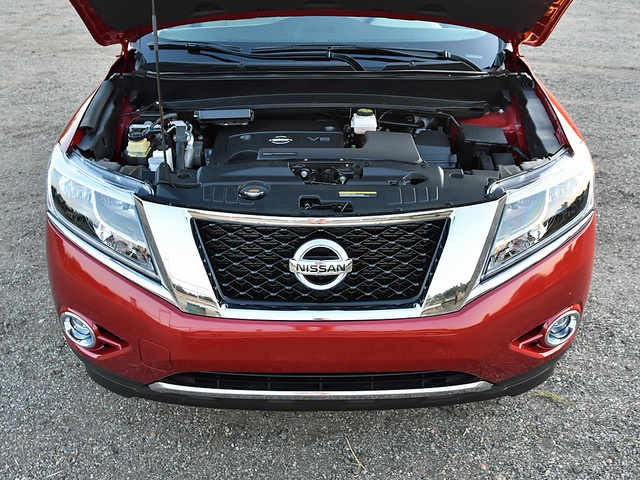 Nissan offers a single engine for the Pathfinder, and it’s a good one. Dependable and powerful, the 3.5-liter V6 engine supplies 260 horsepower and 240 lb-ft of torque, and I got 20.2 mpg on my test loop, just short of the EPA’s estimate of 21 mpg in combined driving. A continuously variable transmission, or CVT, is also standard, feeding the power to the Pathfinder’s front wheels. A 4WD system is optional, and it offers an automatic mode and a lock mode that supplies full-time 4-wheel drive when desirable. Hill-start assist and hill-descent control also help give the Pathfinder added capability should you venture off the pavement. Just keep in mind that with no more than 7 inches of ground clearance and fairly shallow approach, breakover, and departure angles, you’d better not plan to tackle any serious terrain. These 4WD features, plus the Pathfinder’s 5,000-pound towing capacity, help to restore some of the capability lost when Nissan switched this SUV from the Frontier pickup-truck platform to its midsize crossover platform. Apparently, Nissan also chooses to tune the steering and suspension to provide the stiff, brittle ride quality and slow, heavy steering of a traditional SUV. Ultimately, the Pathfinder delivers a better ride and superior handling compared to its more rugged forebears, but feels heavier and clunkier than direct competitors. Such driving characteristics might help Nissan retain Pathfinder loyalists, but they probably won’t help the company convince crossover buyers that this is the best choice in the segment. Comfortable for five people, and ready to transport seven when necessary, the Pathfinder is a pleasant place to spend time. Though the front seats do not employ Nissan’s excellent Zero Gravity seat structure and cushion designs, they’re nevertheless agreeable perches, heated and ventilated in the Platinum model and paired with a heated steering wheel. All that’s missing is a seat-height adjuster for the front passenger’s seat. Once situated behind the steering wheel, fans of buttons and knobs will like the Pathfinder’s old-school control layout. Aside from their displays, the climate and stereo systems are largely divorced from the infotainment system. The Pathfinder even has buttons for radio station pre-sets and a CD player. Rear passengers sit on a sliding bench seat that accommodates three adults. With the seat moved all the way back in its track, second-row occupants enjoy lots of legroom, though foot room beneath the front chairs is unexpectedly tight. If it is necessary to slide the second-row seat forward to make more space for third-row passengers, they’ll appreciate that the front seatbacks are soft and padded, improving comfort levels when seven people are aboard. 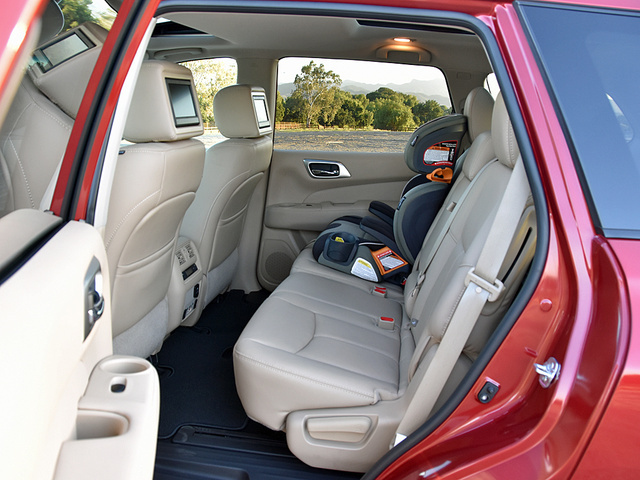 If you have children and they require child safety seats, Nissan makes loading passengers into the third-row seat easy even when a child safety seat is secured in the second row. With the flip of a lever, that second-row seating position slides forward and collapses without necessitating removal of the child safety seat. Of course, you’ll only want to use this feature when a child is not sitting in the safety seat. Adults fit into the third-row seat, and while it isn’t comfortable, there is enough legroom and foot room for shorter trips provided the people in the second-row seat are willing to slide forward a bit. 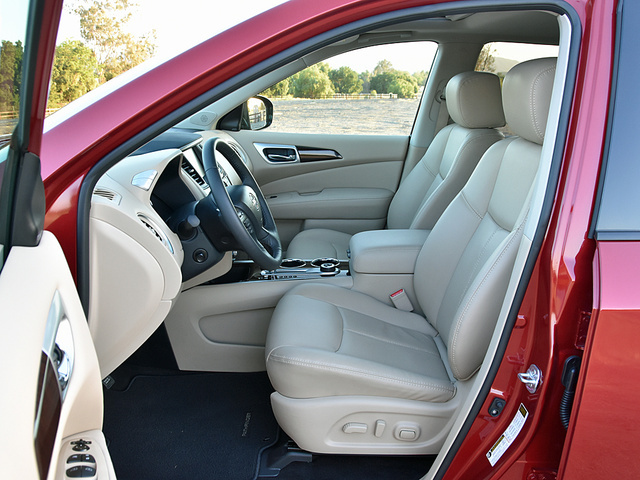 Big third-row head restraints improve safety, and the seat is located farther forward and away from the rear window glass than in some other crossover SUVs, an important consideration with regard to rear-impact collisions. Nissan provides 16 cubic feet of cargo space behind the third-row seat, and a handy covered storage well for carrying smaller items. Fold the third-row seats down to access up to 42.4 cubic feet of cargo space, which is more than enough room for a family of four or five. If you need a little more than that, slide the second-row seat forward. Fold the second-row seats, and maximum cargo volume measures 79.8 cubic feet. While I find the Pathfinder’s yesteryear control layout a refreshing return to familiarity, at the same time I recognize that this SUV’s infotainment system simply is not up to modern standards. It does not offer natural voice recognition. It does not offer smartphone projection, like Apple CarPlay and Android Auto. It doesn’t even have NissanConnect with Mobile Apps, let alone the company’s new NissanConnect subscription services. What does this mean? The Pathfinder doesn’t support text messaging. It doesn’t supply a Wi-Fi internet connection. It doesn’t offer automatic collision notification or easy access to emergency or roadside assistance services. It doesn’t include features designed to encourage teenagers to be better drivers. In other words, it is not competitive in terms of connected technologies. My test vehicle also had the Family Entertainment Package, which included dual viewing screens, wireless headphones, a remote, a 3-prong electrical outlet, and video-game hookups. No trip in the Pathfinder, no matter how short, could be taken without Disney film accompaniment, reminding my wife and I that we will never own a family car with an entertainment system. While the Pathfinder’s infotainment system lacks modern technologies, Nissan does see fit to offer a reversing camera with rear cross-traffic alert, a blind-spot warning system, and a 360-degree top-down monitor that helps to make this SUV easier to maneuver. Plus, because maintaining proper tire pressure is important to vehicle safety, the Easy Fill Tire Alert system makes it easier to do that. However, the Pathfinder is not available with drowsy-driver detection technology, or with a lane-departure warning with lane-keeping assist system. I could have used these during a sleepy late-night drive home from Disneyland. Worse, the Pathfinder can’t be equipped with a forward-collision warning system or an automatic emergency braking system, which means it loses its Top Safety Pick designation from the Insurance Institute for Highway Safety (IIHS) this year. At least you’ll know that if you do get into a wreck, the Pathfinder will do a decent job of protecting you, because it otherwise performs well in IIHS crash tests. The federal government thinks so, too, giving the Pathfinder a 5-star overall crash-test rating. Do you know what “non-plussed” means? That is an adjective that describes a person who is so surprised and confused by something that they are unsure how to react. I am genuinely non-plussed by the Nissan Pathfinder. On the one hand, the Pathfinder supplies a classy cabin, lots of interior room, favorable crash-test ratings, decent fuel economy, and a small amount of extra 4-wheel-drive and towing capability compared to other 7-passenger crossovers. On the other hand, it has virtually no personality, it isn’t particularly rewarding to drive, it is technologically inferior to its competition, and it is no longer capable of finding new paths to the great outdoors. Plus, and totally unexpectedly, Consumer Reports gives this SUV its lowest possible reliability prediction. Undeterred? Based on the deals offered in my area of the country, you can count on getting a rebate of $2,000 or you can finance for 0.9-percent interest for 60 months or 1.9-percent interest for 72 months and get a $500 rebate. Lease deals are also available. If you’re seeking my recommendation on the Pathfinder, I’d say this: If you view vehicle ownership as a necessity and nothing more, and your local Nissan dealership is convenient and offering a killer lease payment on one of these, then sure, drive one for a few years and solve your immediate transportation problem. Otherwise, I think you’re going to be happier with something else. 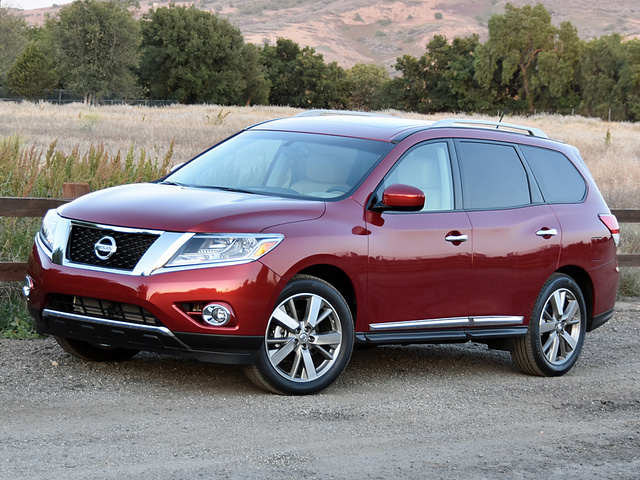 What's your take on the 2016 Nissan Pathfinder? Guru9QCXV I bought the 2016 Pathfinder SL with premium pkg. a month ago and must say I give it a 10 out of 10. Put it on the highway for a 500 mile drive and was more than happy. Great handling, comfort, looks, gas mileage, etc. No complaints so far. TheHorror Wow, one month! What an abundant amount of time from which to draw your conclusions. Guru5C4FL I have had my 2016 pathfinder for over a year and have 27000 miles on it. It is the platinum and I love it! I do miss the sportier body style but the ride and technology for me is great! The four wheel drive on it actually carried us through slimy mud on a wet farm at an auction that other 4 wheel drives were spinning and sliding and my pathfinder moved right on like a little tank! My hubby was extremely impressed. CornerBrook I've had my Pathfinder for 14 months and love it. It's great in snow...and we get a lot of snow in Newfoundland. The Pathfinder is working great and still feels solid. There is lots of room for getaways and it handles and rides great. No issues. Users ranked 2016 Nissan Pathfinder against other cars which they drove/owned. Each ranking was based on 9 categories. Here is the summary of top rankings. 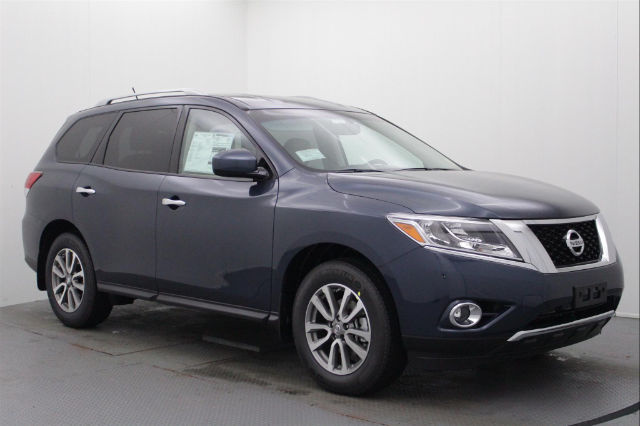 Have you driven a 2016 Nissan Pathfinder? Used Highlander (2013ish) Vs. New Pathfinder?